With the alarming recent rise in hate crimes — targeting immigrants, people of color, and Muslims in particular, including right here in our community — support and resources for students have taken on critical urgency. Below is a list of resources — on campus, in Evanston/Chicago, and nationally — that are available. This resource offers an overview of how interfaith groups can respond to Islamophobic, anti-Semitic, and other acts of hate targeting specific religious groups on campus. It covers how you can act quickly after an incident, strategize how to move forward, and educate yourself and others about different worldviews. Information on how to report a crime, suspicious activity or an emergency. The Bias Incident Response Team (BIRT) is a group of Northwestern staff who are committed to creating a proactive response to instances of hate and bias. 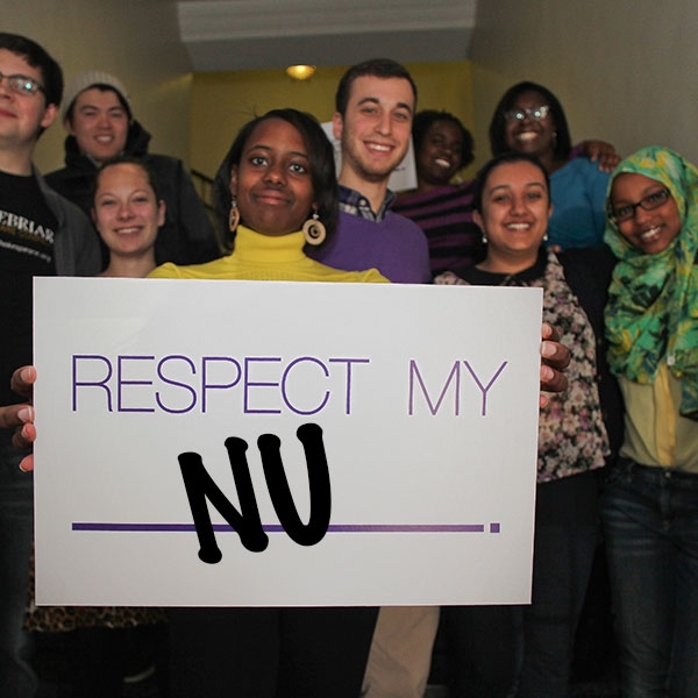 When a student reports a bias/hate incident through Respect NU, one of the BIRT members will support the student, connect them with the appropriate resources, and follow-up with them until the situation has been resolved. Report the incident to BIRT (Bias Incident Response Team) at Northwestern. They will talk with you about resources for your care, actions you can take, and possible outcomes. If you have questions about an incident, they can also help answer them. Students: To report a bias/hate incident online, complete the Bias Incident Form. The form will be submitted to the Department of Campus Inclusion and Community. Faculty and Staff: To report an incident online complete the Ethicspoint Form. Your message will be directed to the appropriate office for follow-up. Visit the Ethicspoint website. Additional information can be found at http://www.northwestern.edu/nuhelp/ or on the NUHelp app (Download the NUHelp App). Call the police: 911 for emergencies, 311 non-emergencies. REPORT IT AS A HATE CRIME. If you are not in danger, you may wish to call BIRT beforehand to get advice for what may be an emotionally trying experience. If you are unsure about whether or not it is a crime, you may wish to call BIRT beforehand. Report the incident to the local FBI field office: 312-421-6700. If you are undocumented you should seek advice from BIRT before taking this step. Be aware that you will have to re-tell your story, and so might want to seek additional support beforehand. Report the incident to the Southern Poverty Law Center, a national organization that monitoris reports of hate crimes, racist harassment and intimidation. If there is a crisis, an appointment is not necessary. You may stop by the Chapel Office (Parkes Hall, Room 139) between 8:30am and 5:00pm or leave a message for Chaplain Stevens at 847-491-2298. After hours call 847-864-7865. Dedicated to promoting the rights of immigrants and refugees to full and equal participation in the civic, cultural, social, and political life of our diverse society. IMAN’s organizing and advocacy agenda is driven by leaders who are directly affected by and deeply invested in the issues, and guided by the organization’s deep spiritual convictions around principles of human dignity, social justice and compassion, particularly for marginalized people of color in the inner-city. IMAN has effectively mobilized the larger Chicagoland Muslim community around several issues directly affecting the working poor living in the inner-city. The mission of the Jewish Council on Urban Affairs is to combat poverty, racism and anti-Semitism in partnership with Chicago’s diverse communities. Its Jewish-Muslim Community Building initiative works to build relationships between the Jewish and Muslim communities in Chicago. These relationships help to dissolve barriers of potential bigotry and ignorance and to foster a culture of genuine understanding and respectful discourse. South Asian American Policy & Research Institute (SAAPRI) is a non-profit, non-partisan organization established in 2001 with the mission to serve South Asian Americans in the Chicago area, by using research to formulate equitable and socially responsible policy recommendations. SAAPRI’s work has included research and policy initiatives on civic engagement, hate crimes, access to health care, economic development, and immigration. ADC is a civil rights organization committed to defending the rights of people of Arab descent and promoting their rich cultural heritage. ADC supports the human and civil rights of all people and opposes racism and bigotry in any form. The Anti-Defamation League was founded in 1913 "to stop the defamation of the Jewish people and to secure justice and fair treatment to all." Now the nation's premier civil rights/human relations agency, ADL fights anti-Semitism and all forms of bigotry, defends democratic ideals and protects civil rights for all. Since 1991, Asian Americans Advancing Justice (AAJC) has fought to create a seat at the table for Asian Americans in the national conversations that determine the policies that shape our lives. We educate lawmakers, the public, and the media about our diverse community and its needs. We advocate on behalf of our most vulnerable communities, as well as other minority communities whose liberation is essential to creating a more just society for all. We litigate in order to defend and promote the voices of Asian Americans and underserved communities on significant civil rights issues. The Bridge Initiative is a Georgetown University research project that extends information about Islamophobia to the public, bringing together celebrated faculty, subject-matter experts, and seasoned researchers to examine attitudes and behaviors towards Muslims; dissect public discourses on Islam; and uncover the operational mechanisms of engineered Islamophobia in an effort to raise public awareness and enrich public discourse on this pernicious form of prejudice. The Council on American-Islamic Relations (CAIR) is a grassroots civil rights and advocacy group. CAIR is America's largest Muslim civil liberties organization, with regional offices nationwide. CAIR's mission is to enhance understanding of Islam, encourage dialogue, protect civil liberties, empower American Muslims, and build coalitions that promote justice and mutual understanding. The Center for Constitutional Rights is dedicated to advancing and protecting the rights guaranteed by the U.S. Constitution and the Universal Declaration of Human Rights. Founded in 1966 by attorneys who represented civil rights movements in the South, CCR is a non-profit legal and educational organization committed to the creative use of law as a positive force for social change. CCR employs litigation, education, and advocacy to advance the law in a positive direction, to empower poor communities and communities of color, to guarantee the rights of those with the fewest protections and least access to legal resources, to train the next generation of constitutional and human rights attorneys, and to strengthen the broader movement for social justice. Interfaith Youth Core is a national movement for interfaith cooperation, with a focus on college students. MuslimARC: Our mission is to provide racial justice education and resources to advance racial justice, through Education (resources and training for racial justice), Outreach (building multi-ethnic and intra and interfaith coalitions for racial equity), and Advocacy (increasing awareness and and amplifying grassroots efforts that advance racial justice). Network Against Islamophobia (NAI), a project of Jewish Voice for Peace, was created to serve as a resource to, and work with, JVP chapters and other groups interested in organizing against Islamophobia and anti-Arab racism and to be a partner to the broader, Muslim-led movement against Islamophobia. NAI facilitates online resource-sharing of FAQs, public letters, press statements, articles, and other materials. NAI has also developed curricula and resources for those interested in holding community workshops and becoming more knowledgeable, effective, and principled in our work. South Asian Americans Leading Together (SAALT) is a national, nonpartisan, non-profit organization that elevates the voices and perspectives of South Asian individuals and organizations to build a more just and inclusive society in the United States. SAALT is the only national, staffed South Asian organization that advocates around issues affecting South Asian communities through a social justice framework. SAALT’s strategies include conducting public policy analysis and advocacy; building partnerships with South Asian organizations and allies; mobilizing communities to take action; and developing leadership for social change. Shoulder-to-Shoulder is a coalition of 32 religious denominations and organizations committed to standing with American Muslims to uphold American values. The Southern Poverty Law Center (SPLC) is the premier U.S. non-profit organization monitoring the activities of domestic hate groups and other extremists – including the Ku Klux Klan, the neo-Nazi movement, neo-Confederates, racist skinheads, black separatists, antigovernment militias, Christian Identity adherents and others. We’re currently tracking more than 1,600 extremist groups operating across the country. We publish investigative reports, train law enforcement officers and share key intelligence, and offer expert analysis to the media and public. SPLC's Hatewatch monitors and exposes the activities of the American radical right.